Alcohol is one of the most commonly used psychoactive substances in the world. Over 85 percent of American adults (aged 18 and older) report drinking alcohol at some point in their lives (as of 2015), the National Institute on Alcohol Abuse and Alcoholism (NIAAA) publishes. Alcoholism is considered a brain disease since repeated abuse can actually alter brain chemistry and cause both physical and psychological dependence. NIAAA reports that over 6 percent of adults in the United States battle alcohol addiction but less than 10 percent of those who needed help got specialized treatment in 2015. The traditional method of complete abstinence required by most programs may not be ideal for everyone. Programs like Alcoholics Anonymous (AA) ask their members to abstain completely from drinking alcohol as the only requirement of membership. AA is also faith-based, and members are to turn themselves over to a higher power as part of the 12-Step program. Moderation Management (MM) is an is an alternative nonprofit peer support group that is secular and allows for moderate drinking. Founded in the early 1990s by Audrey Kishline, MM was designed as an alternative to AA and traditional abstinence- and faith-based programs. Moderation Management is designed for those who fall into the mild or moderate alcohol addiction categories and is not meant for those who battle significant addiction. Withdrawal symptoms from alcohol can be severe and even life-threatening in the case of significant dependence and therefore should always be managed with professional care- often in the bounds of a medical detox program. MM postulates that while millions of people drink and may even be problem drinkers at times, not everyone battles alcohol addiction, and these people may be able to learn how to drink safely in moderation. MM is run similar to AA in that meetings are led by laypeople, and there are chapters all over the country. Moderation Management defines a moderate drinker as one who enjoys a drink now and again, but is not controlled by alcohol, and alcohol does not interfere with life obligations or functions of everyday life. MM stipulates that its members not drink more than 3-4 nights a week, don’t drink more than an hour or two at a time, do not drink and drive, keep their blood alcohol concentration (BAC) to 0.055 percent or lower, and drink fewer than nine drinks a week for a woman (three per occasion) or 14 for a man (four per occasion). They also stipulate that members do not drink before attending meetings and do not socialize with other members in situations where alcohol is present. Attend meetings either in person or online and learn about the program. Stop drinking and remain abstinent for 30 days while performing steps 3-6. Look closely at how drinking has impacted your life. Examine what you have been drinking, how often, and how much. Learn and adhere to the guidelines set forth by MM for moderate drinking and drinking limits. Set small attainable goals for drinking within the moderation limits and guidelines, and work for moderation and balance in other parts of life as well. Update goals and review personal progress. Keep making healthy lifestyle changes and continue to attend meetings for continued support and/or to mentor others. Moderation Management asks newcomers to make a drinking diary and to identify problematic drinking patterns, triggers, and issues that drinking has caused in their lives. During “the 30,” as the month-long period of abstinence at the start of the program is called, people are asked to learn methods of coping with cravings, learn new skills for avoiding drinking, fill their time with healthy activities, and learn how to manage potential triggers. Individuals may decide to revisit any of the nine steps at any time, including the 30-day abstinence period, if alcohol seems to be becoming a problem once more. If at any point a person suffers from serious withdrawal symptoms, or finds that sobriety is too difficult to maintain with this method, MM agrees that an abstinence-based program may be a better fit. Moderation Management may be a way for a person to ease into recovery, as it can seem initially less daunting than complete abstinence. An individual may be resistant to traditional treatment models, and MM may be a method of encouraging a loved one to receive some form of support and encouragement toward recovery. Once a person attempts to stop drinking for the 30-day period, they may then realize how much control alcohol really has over their life. Harvard Healthpublishes that this may provide incentive or motivation to stop drinking altogether. A person may decide to then enter into a more comprehensive treatment program after beginning Moderation Management. Alcoholism is a chronic and relapsing disease, and generally speaking, the more severe the dependence and addiction, the more common relapse will be. Those who drink less alcohol less often may be better suited to a Moderation Management-type program than those who consume more alcohol on a regular basis. Again, individuals battling severe alcohol dependence should NOT attempt an MM program. Severe alcohol withdrawal can be fatal without proper care. There is a great debate between the pros and cons of moderation versus complete abstinence. Regular participation in a 12-Step program like AA that requires abstinence has been shown to be beneficial to long-term recovery, as published by the Journal of Addictive Disorders. 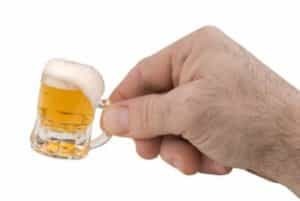 Other studies reported by the Journal of Consulting and Clinical Psychiatry show that nondependent problem drinkers may be able to reduce their drinking through a program like Moderation Management, however. Moderation Management can seem like a valid answer to those who need some help learning how to control their drinking and how to manage cravings and possible triggers without the pressure of feeling like they can never drink again socially and without the labels of the disease model. It may not work for everyone, however. Even the founder herself was unable to drink in moderation and ended up relapsing and getting into a serious car accident after driving drunk, NBC News reports. Audrey Kishline was unable to follow her own rules of the MM program and admits that it might not be an effective strategy for everyone, including her. For those who struggle with alcohol cravings and alcohol dependence, even drinking in moderation may lead to a dangerous relapse and problem drinking again. Psychology Today publishes that individuals who do not remain sober for at least a year relapse about two-thirds of the time, while those who remain sober for five years only suffer relapses at rates of 15 percent or less, indicating that long-term abstinence may lend itself to long-term recovery. Each individual is likely to follow their own path, and there are pros and cons to both Moderation Management and complete abstinence. Both abstinence-based programs and MM help people to develop new life skills, healthy habits, coping mechanisms, and better self-control. Both strive to help individuals live healthier and happier lives by providing encouragement and support. In short, individuals with fewer drinking problems and low levels of dependence may benefit from MM. When alcohol interferes with daily life and a person struggles with compounding concerns related to drinking, abstinence-based programs and a comprehensive treatment program may be optimal. Treatment programs should be tailored to the individual in order to discover what works best for them and their personal recovery.